Obviously it’s on youtube. if you have a second, and you thought it was worth watching, please up-vote it on the youtube site. better still, share it on facebook or twitter. That kind of thing is really helpful, and it doesn’t take much effort to do it. I really appreciate it. Also, does anyone have any good ideas for sites to submit/notify about this sort of thing? I’ll post it to the GTB moddb page, and also nervously submit it to reddit, but I’m not sure where else it should live. It takes a silly amount of time and effort to make a video, in comparison to a normal blog post. i want to get into the habit of promoting GTB through video though, because it looks so much better in motion. I started early work on the tutorial today. yay! I bought skyrim, partly because I did enjoy oblivion, partly because skyrim got great reviews and any decent game dev should know what people are buying and enjoying. So far, It’s pretty good, but I’m not bowled over. I don’t see it as any major (or even minor) change or improvement from Oblivion. Maybe I haven’t played it enough yet? There are a number of minor things that make me smile, more than disappoint, such as all of the guards sounding like schwarzenegger, and all the women assuming I want to sleep with them. That’s my normal expression, I swear! More seriously, the game does not seem to have moved on at all, in the field of interaction with NPC’s, which is a big surprise. It’s 2011 now (nearly 2012), so we still need almost static NPC’s that act pretty much like ‘gossip+quest+lifestory vending machines’. Coding a much more adaptive and context sensitive system shouldn’t be hard. I find it very unlikely that there is a major problem from either a game design or code POV, in having every NPC store some data abut their attitude to you, plus a list of recent events, plus reaction to your appearance. We *can* do better than this. On an indie game, with a tiny budget and one coder, we can do better, so why a game with the budget of skyrim cannot, is beyond me. Unless…. 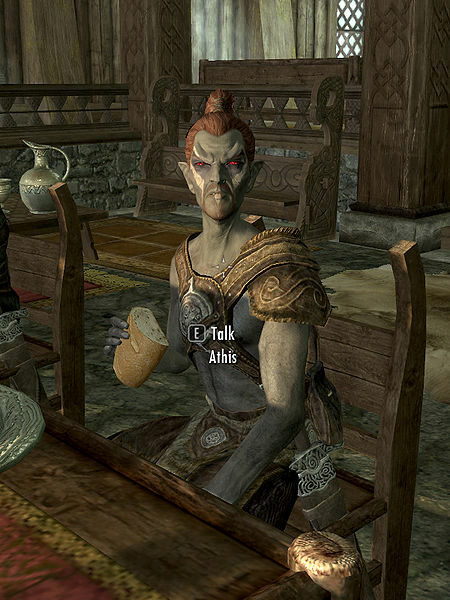 AI coders on skyrim grind their teeth like maniacs, knowing that the simplest and cheapest text adventures can have twenty times more immersive character interaction that the trillion dollar AAA hit game skyrim. Is it *really* so vital to have voice acting for all NPC’s? I find most acting in movies to be tragic, let alone acting in games. I would be much happier if ‘lesser’ NPCs had just text, (maybe some simlish mumbling?) but they actually said something relevant and believable. Immersion is NOT just graphics and sounds. If it was, who would buy books? Sometimes dialog really matters, and in an epic RPG it is vital. Skyrim has (like most games) prioritised screenshots & trailer clips over actual immersion, at least when it comes to AI. You probably all thing I’m wrong, the game scored massively highly and sold by the crateload. What do you think? Is it just me that wants to smack the NPC’s and say “I only just met you, you f**king robot!”. In all these days of bundles and steam sales and DLC and blah blah, people are happy to shout loudly about what they think about any particular pricing model or experiment, but I don’t come across much discussion about pricing models in theory, from first principles. So I’m going to ask, in theory, given magical powers to make anything work (like workable DRM, or perfectly rational customers etc), how would we sell and price PC games? The financial success of a developer is independent of any personal relationships or circumstances. Games should not be hits because the developer plays tennis with the owner of another company etc. There should be a strong system of market signals. Good games should make piles of cash. Poor games should fail, thus encouraging future promotion of good games. It should be financially viable to produce niche games, not just blockbusters. Do these principles seem sound? Any I’ve missed? Given that we accept these (for the sake of further typing…) what sort of system would exist, or what changes need making to the current industry to move us closer to it? I feel that the existence of a few major distributors and publishers that have gatekeeper status seriously undermines 2) and to some extent 5). I think that piracy of games seriously undermines 1) and can cause problems for 6). My main concern is with 1). If 2 games cost $10 and one provides an average of 22 hours of play time per purchaser and the other provides 3 hours, we really should be finding a way to get more money for game 1’s developers. The solution to that could be DLC, where the 22 hour players are happy to pay more because they are still into the game. Does that seem fair? It certainly seems more viable that game setting it’s price at 7 times that of game 2. Of course, it could be said that game 1’s better quality will lead to great word of mouth and 7X the sales, but I’m not sure that works in practice. More widespread use of demos would help with item 3) surely? or could we make an argument that DLC helps here too, because with DLC as an option, players are spending more closely what they choose to buy? Maybe we should go so far as to say that F2P and microtransactions solve all of these problems? except that kills of 6), because the many players + few whales strategy doesn’t scale down easily to niche. No wonder game pricing is such a mess. On my todo list for ages was fixing damage sprites so they glow in the dark. It always bugged me that my damage sprites were not really good enough, to my mind. We have wood-burning stoves at my house, which I light almost every day right now, and for a lot of the time I worked on GSB I used to sit there staring an a blazing inferno of logs and coal and feel annoyed that the damaged bits of spaceships didn’t look that awesome. I am using a very similar system for GTB, although with less hassle for placing the individual damaged locations, which makes it a bit easier for modders. They still do not pulse and glow the way i want. Which they now do, and I’m very happy about it. Unfortunately it took 2 days work, because in investigating it, it turns out I had to totally re-write my lighting system. 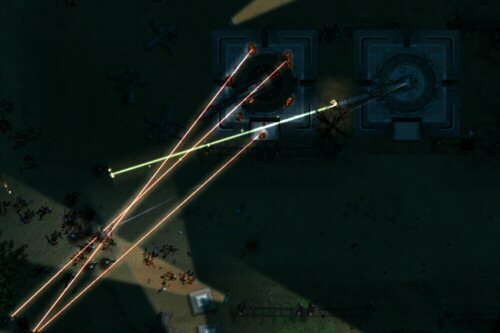 The game uses multiple render targets for the lighting and composes them right before displaying the end image, which means that anything that actually gives off any light, such as a searchlight, laser beam, particle, or damage sprite, needs to also render to the offscreen lightmap buffer. It also means you have to batch these, and there are all kinds of annoying unlikely scenarios where it actually breaks down, in some way, although I doubt anyone will ever notice. At the end of those 2 days, I was very glad I took the effort. Maybe one day I’ll manage to get them pulsing properly, and have particles flitting around ‘inside’ the damaged areas. Maybe! So have you all seen this? Quite a few people probably guessed it was coming due to my tux image tease, but GSB is part of the Humble Indie Bundle. Yes, that means there is a linux port of the base game, for people who prefer to run native linux builds I do NOT have the final linux installer yet, so if you want a linux build and you bought GSB direct from me (so I can verify the sale), then you will be entitled to it for free, once I have it. Don’t email me asking for it yet, because I can’t reply with a link, and it will get complex and bottlenecked. Obviously I’ll blog it when it’s all ready. A few words about the bundle, and Gratuitous Space Battles being in it (as one of the ‘beat the average’ games). Some people have expressed surprise about this move, because I rant about devaluing of games, and bundles a lot, so why am I doing this? Firstly, it’s the beat the average game :D You can’t pay $0.01 and get GSB, can’t be done, so there is that in there. Secondly, GSB is actually quite old now. It got updated a LOT, but it’s release was September 2009. It’s been full price everywhere for a long time, so I’m much more flexible regarding stuff like this at this stage in the games sales cycle. Also, there is a new game coming in the first quarter of 2012, it can’t do any harm to remind people about GSB, and to get people who sat on the fence for those two years to grab a copy at a discounted price. Hopefully when GTB comes out they will be more inclined to buy it at full price rather than wait another two years. I hope! I often talk very frankly about sales figures and games revenue, but that’s regarding direct sales. Humble Bundle is a proper publisher arrangement with contracts etc, so don’t ask me for financial details about splits etc, because I can’t talk about that. As I typed this, the total raised has passed a million dollars. That’s good then :D.